The good news is you never hit the ground in Sky Hero. The bad news is that it's not the landing that kills you every time, it's the fall. You'll still have a fun ride on the way down in Kokonut Studio's quirky twist on an infinite runner that screams of game-jam origins. That's my guess based on the crazy retrofitted premise to why your brave soldier, John, would fling himself from a burning tower that is, well, it's very tall, let's put it that way. John's enemies aren't content to let him plunge to his death after destroying his castle, either. He's pursued to the bottom by a laughing anthropomorphic fireball, and must evade mustachioed barrels, clumps of spikes wearing propeller beanies, birds carrying saws and cannons that materialize and fire at you from the sides. Now do you see what I mean about crazy game-jam origins? I don't know that for a fact, of course. The oddest inclusion of Sky Hero is also its most distinguishing in a crowded genre: using location-specific weather. I've only contemplated this as a value-add in sports titles, but here, the background to your plunge will reflect what's going on outside your door, provided you enable location services. Unfortunately, it was sunny and clear both days since I picked up Sky Hero. (Did I really just call sunny and clear weather unfortunate?) So what I saw never really changed. But if it's windy, the gusts will blow John side-to-side. Clouds will obscure what's on the screen, as will snow or rain, and the light will change, from day to dusk to night. As for the action itself, Sky Hero poses a stout enough challenge that leaves you feeling not only that you can beat your all-time best distance on the next try, but that it's worth doing so. Put simply, hitting one enemy puts Mr. Fireball hot on your tail. Hitting another with him right behind you means game over. You steer around the foes by using touch controls left or right (recommended) or tilt controls (not). You can put some space between John and the fireball by picking up speed boosts (represented by down arrows) but it doesn't stack. Picking up a boost with the fireball not on your screen doesn't give you three hits before death, in other words. On a small screen, the powerup icons are small and low-contrast (white orbs with a question mark inside them) so you really have to look for them. So far I've unlocked two special abilities: a suit of armor (invulnerability for a few seconds) and a shower of coins, the in-game currency that allows you to unlock additional bonuses, one-use boosts, and a closet full of silly costumes. 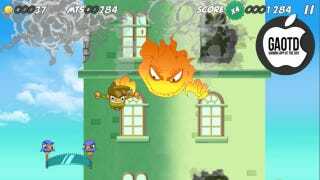 If Sky Hero has a drawback it's in its virtual economy. An average fall will net you between 150 and 200 coins. Powerups begin at 2,500 coins. That's a long way down just to give John a little extra advantage. You'll unlock some of these abilities simply by dropping a cumulative distance, but those totals are steep, too. I just unlocked the gold shower (snicker) and I'm 12,913 meters to my next reward. My last drop was 1,678 meters, and the game lasted about two minutes. With free stuff taking so much work to acquire, it feels like Sky Hero is steering you to its in-app store to buy up coins, put John in a Superman suit and give him a couple second-chance revives. (They're sold in lots of 99 cents, $1.99 and $3.99) That's fine with me because the basic game experience, at 99 cents, is still enjoyable, and falling without using powerups (or using them sparingly) is a kind of personal-honor challenge I've set for myself. Still, I've got 95,414 meters to go before I unlock the second of the game's two (2) skins, Dragon's Temple. (As of this writing, a day after release, only six people have unlocked it.) A third is "coming soon." I get that the point of an infinite runner is to set demanding incentives that keep people playing, but that seems a little too far out of reach for some visual variety when you're having nothing but great weather outside. All told, Sky Hero is worth the buck. I enjoyed the simple gameplay and charming, how-does-this-fit-together presentation. You could even say I fell for it.